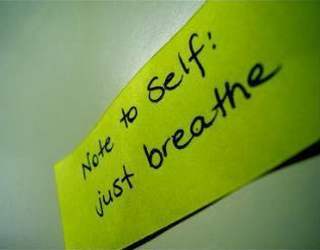 OK... so I have given you some advice of what to do and where to be careful about in regards to being aware of the breathing. And here is the question about me and whether I am absolutely aware of my breathing in every moment ? Am I a hypocrite then ? Well... we can say so... but at the same time I am in my process of getting there and I have already made some important realization. And thus I share what I have proven to myself and what I know from experience. Now... I have heard for the first time about the importance of conscious breathing many years ago when I was learning about and practicing rebirthing ( the technique which was invented by Leonard Orr ). And later I also heard about it many times while being on my path of spiritual development. So I realized that breathing is very important already then but it was only about 6 years ago when I started to listen to the video interviews and articles from Desteni Group and then I found a detailed explanation of why this breathing is soooooooo important. But even then I did not get full on to it. I did try my best but still today I am far away from the objective of awareness of breathing in every moment. So this is a process and that is why I say that most of the people will not get there in an instant and it will take them and myself many years to accomplish ( if we will achieve it at all ). So... although I am still not there fully I already know that this is something which I will not regret. It is really annoying at the moment that I struggle so much and I really have to push myself even though I don't want to do it sometimes and simply slack of and get back into the comfort zone. But it doesn't matter. I will go on. Because I also know that I have no choice anyway. If I don't do it now then I will have to do it in the "after life" when I die. I will not have my physical body then but yet I will have to get myself into the awareness. So... the objective is clear. I know that I have no choice but still I want to do it for myself because I know the importance of it.